Missing shingles – If you notice that you’re missing shingles on your roof – even just one or two – call roofing companies in Rock Hill, SC right away. Shingles act as barriers against water, hail, and debris. Roof leaks can easily form in spots that aren’t covered by shingles. If there’s bad weather or if you notice any fallen tree limbs around your property, contact our roofing contractors. We’ll come by and check to see if your shingles were damaged or if you need repairs. You see water when it rains – As the saying goes, when it rains it pours. If you suspect a leak and want a quick way to discover what’s going on, check your attic during a storm. Take a flashlight and shine it towards the roof while it’s raining. If you see water coming in, you have a roof leak. Water stains – If you’ve noticed unexplained water spots on the walls or ceiling of your home, it’s time for a roof inspection. 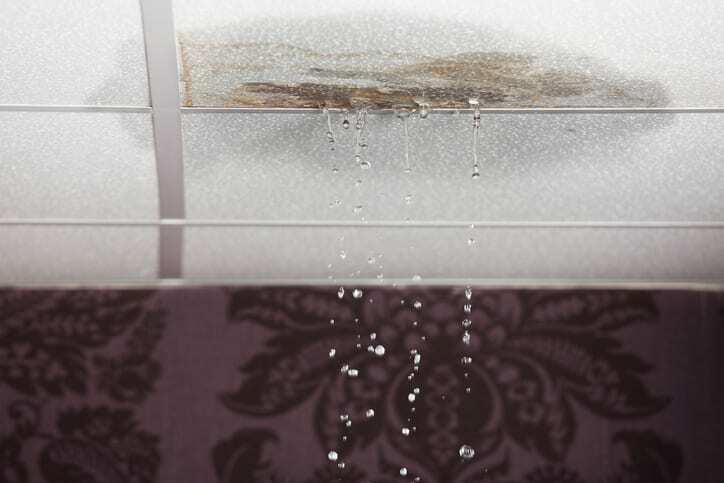 Water stains are one of the leading indicators of a roof leak. Mold growth – Mold growth inside your home is another common sign of a roof leak. Mold develops from a buildup of moisture. A roof leak can allow moisture to enter your home. Besides causing damage to your home, mold can also be harmful to your health. Get it checked out as soon as possible. When you need roof leak repairs, call Champion Services. We offer reliable services for roofing in Rock Hill, SC, including repairs and replacement. Get a roofing estimate today!